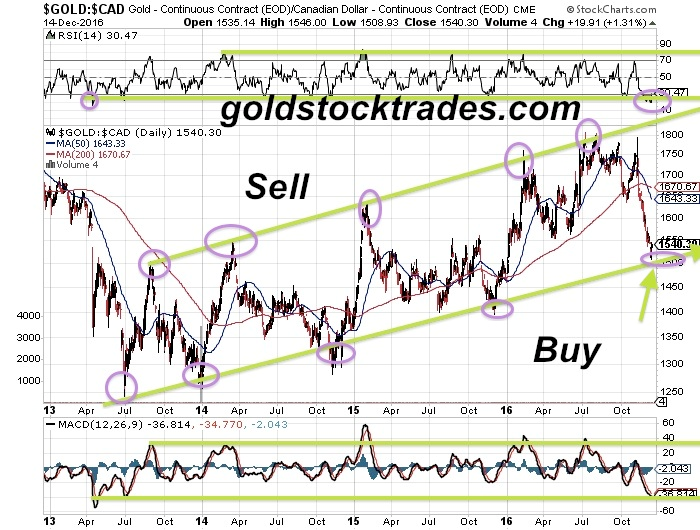 Gold and silver could once again be ready to rally possibly starting in days or in the beginning of 2017. Precious Metals usually bottom at yearend…then have massive rallies in the New Year. Remember the lower it goes the higher it runs - and the more gains made in the following year. Right now the US dollar (UUP) is extremely overbought while precious metals are the most oversold in many years despite being in a long term uptrend. This strong US dollar in relation to other collapsing currencies has made it very difficult for miners and explorers over the past few years. It will also make it harder for foreigners to invest in US real estate or buy US goods. The rising dollar and higher interest rates are a double whammy for those paying off large debts including our US Federal Government. The dollar is hitting a 15 year high making it very hard and expensive for US mining, manufacturing and real estate. This currency imbalance of strong US dollar versus weak global currencies could change quickly under President Trump as he has already committed to taking on other nations who have been devaluing their currencies to gain a competitive edge with trade. The junior mining sector and precious metals continue to be in a bear market due to this rising dollar and QE Taper since 2011 while other nations have been devaluing their currencies to ridiculous low levels such as the Yuan, Ruble and Rupee. The bear market in precious metals and junior miners appeared to end in the beginning of 2016 but was smacked down as the rise of Trump in the US has even pushed stocks and the US dollar even higher. Meanwhile precious metals and the miners remain dirt cheap testing major support. The precious metals are very oversold and ripe for a reversal as they usually bottom at year end then have massive rallies in the New Year. This seasonal pattern has been strong even during this bear market. I believe Trump will support inflation and infrastructure and should run into even further deficits. I believe the Euro is slowly disintegrating. China, India and Russia are crashing their currencies to support their economy through exports. The Middle East Sunni Shiite War is worse than ever. All this uncertainty leads me to want to hold gold and silver not fiat currencies. The QE taper and fear of rising rates has caused gold to correct in US dollar terms meanwhile its soaring in terms of Yen, Euro and Yuan. However many are concerned Central Banks worldwide are secretly suppressing gold and silver prices manipulating prices lower. Remember it suits the Central Banks to keep the price low as they are some of the largest buyers during this pullback. They don't want the average Joe to pull their cash burning a hole in their pocket in favor of gold and silver coins. The victory of Trump for US President caused a huge selloff in precious metals and miners as investors focused on the banks as interest rates soared. There was a huge risk on rally as investors bought stocks and dumped bonds and precious metals. However, that first reaction may be a knee-jerk one and cause a blow off move in stocks and the dollar. Precious metals and mining may even grow greater in favor under President Trump. Trump wants inflation and supports mining and manufacturing which has been almost destroyed over the past eight years by regulations. Now may actually be the turning point in precious metals going into year end when gold is pulling back to uptrend support and is very oversold. The recent correction in gold (NYSEARCA:GLD), silver (NYSEARCA:SLV) and the miners (NYSEARCA:GDX) especially the explorers (NYSEARCA:GDXJ) is quite normal from a seasonal perspective. Precious metals sell off into yearend only to see powerful rallies in the New Year. Remember the lower it goes the higher it runs and the more gains made in the following year. Precious metals and currencies are volatile and the worst move could be buying it at the extremes. Right now the US dollar (NYSEARCA:UUP) is extremely overbought while precious metals are the most oversold in many years despite being in a long term uptrend. Disclosure: I do not own shares in any of these ETF’s.